But the seder also reminds me that with every stinging bite of bitter maror comes the sweetness of charoset. I attended my first Passover seder when I was 20 years old. My best friend Becca and I had driven from Boston to Albany, where her family lived. We didn’t tell her parents that the real purpose of the trip was to see Ani DiFranco in concert – it just happened to land on the first night of Passover. We left the seder early to catch the concert, leaving Becca’s little brother to find the afikoman. Suffice it to say, it took a few more years, and falling in love with a man who grew up as an Orthodox Jew, for me to appreciate the true meaning of Passover. For almost 10 years now, my husband and I have hosted our own seders for a motley crew of queer Jews and non-Jews. It’s important to both of us that we honor his faith tradition and our shared commitment to social justice. For our seder, we stitched together a “Wuvine Family Queer Passover Haggadah” from multiple sources (“Wuvine” is an amalgam of our last names), which applies the Passover story of the liberation of the Jewish people from slavery, to the fuller context of our lives. Our Seder plate includes an orange to represent the inclusion of LGBTQ Jews in Jewish life. And yes, we do end our Seder by singing “Somewhere Over the Rainbow”! Our yearly ritual, like so many seders, seeks to translate history, promote inclusion, and shine a light on the struggles for freedom present in our world today. Each year, we tell the story of our ongoing LGBTQ liberation, using each of the four cups of wine as symbolic markers in history. With each cup we discuss a moment in LGBTQ movement history: the founding of the Mattachine Society and the Daughters of Bilitis; the Compton’s Cafeteria and Stonewallriots; up to GLAD’s marriage equality victory at the U.S. Supreme Court. Each cup allows us to recognize the countless individuals on whose shoulders we all stand. I also write something new every year for a fifth cup, to highlight one important current LGBTQ issue. This year, we will dedicate that fifth cup to the incomplete work of fully including transgender lives into society. 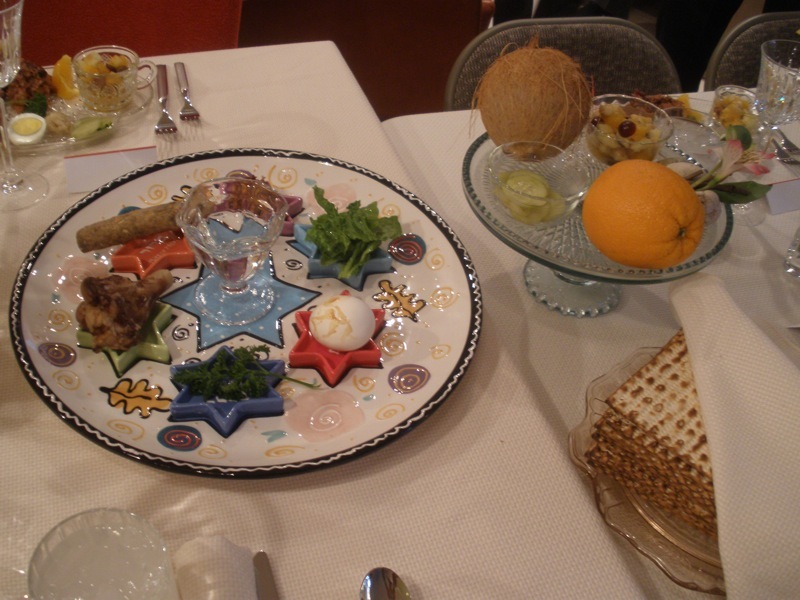 The salt water and bitter herbs on the seder plate are not just reminders of the tears and hardship of antiquity – they remind us of the hate and ignorance trans people still face today. Just last month, North Carolina made deplorable history in passing one of the most restrictive and anti-trans bills ever in our country – forcing trans people to have to use restrooms that are neither appropriate nor safe. But the seder also reminds me that with every stinging bite of bitter maror comes the sweetness of charoset. And so while we remember the many trans women, especially women of color, whose lives were violently ended this year, including Zella Ziona, Lamia Beard, Taja Gabrielle de Jesus, Mya Hall, our seder will also include a recitation of the names of some of my trans heroes and roles models, including Janet Mock, Nicole Maines, Kylar Broadus, Phyllis Frye, and Jennifer Finney Boylan. Through our queer liberationist seders, I have grown to appreciate, and love, the spirit of Passover, and the lesson I reaffirm each year. Lo alecha hamlacha ligmor, v’lo ata ben-chorin l’hivateil mimenah . But most of all, I value the process of telling the story of our ancestors – both literal and figurative – and their struggle toward justice and liberation, so that history informs our present, and that we never take for granted the freedoms we have won.